Following on from Your neck is pathetic, I offer you the fifth presacral vertebra of the Brachiosaurus altithorax holotype specimen FMNH P25105, in right lateral view, with a complete human dorsal column for scale. Why is this vertebra designated “presacral 5”? Because the Brachiosaurus holotype specimen included an articulated set of the last seven dorsal vertabrae (and the sacrum, two caudals, a coracoid, humerus, ilium, femur and some ribs) but none of the more anterior dorsals. Rather than guess how many dorsals there were in life, so that he could assign serial positions to the seven that were preserved, Riggs (1903) very sensibly just counted forward from the sacrum. So how many dorsals did Brachiosaurus have? We must have plenty of better specimens by now, right? Wrong: despite more than a century of fossil-hunting in North America, Riggs’s specimen, which he described in detail in 1904, remains by far the best and most complete that has been described in the published literature. All the other specimens that are of any scientific value consist of isolated or doubtfully associated elements, and in any case have not been described anywhere near as well as Riggs dealt with his material. There are apparently some much better specimens in private hands, but, well, they are effectively lost to science — at least until the owners die. 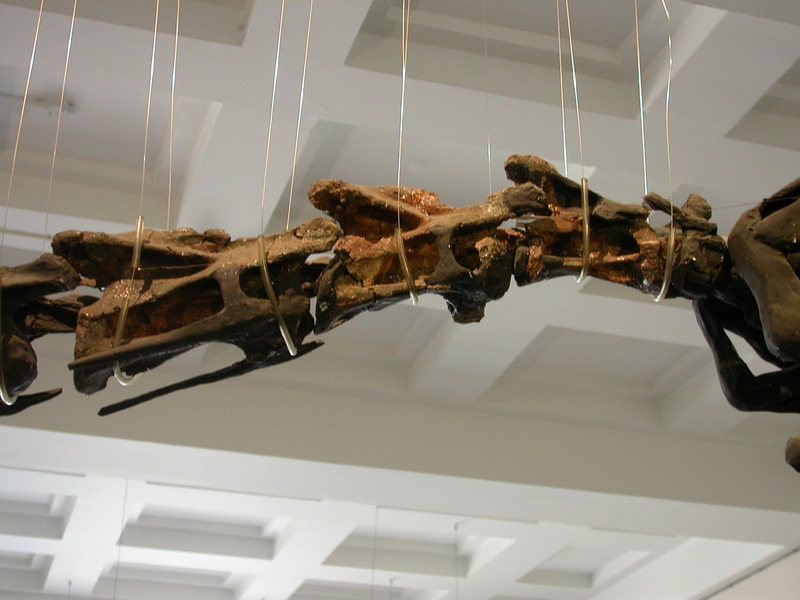 When Janensch (1914, 1950) described the African species Brachiosaurus brancai from Tendaguru in Tanzania, he reconstructed it with 11 dorsals, and that number has been pretty much accepted ever since. However, as pointed out by Paul (1988), Migeod’s (1931) description of a Tendaguru brachiosaurid that has been generally accepted as a specimen of B. brancai indicated that it had at least 12 dorsals. Although Migeod’s specimen is probably generically distinct from both B. altithorax and B. brancai (Taylor 2005), it still provides the best evidence we have of the vertebral formula in brachiosaurids. So, twelve it is, until better evidence turns up. Distressingly, none of the other brachiosaurids or putative brachiosaurids that we know about (Sonorasaurus, Cedarosaurus, Sauroposeidon, etc.) 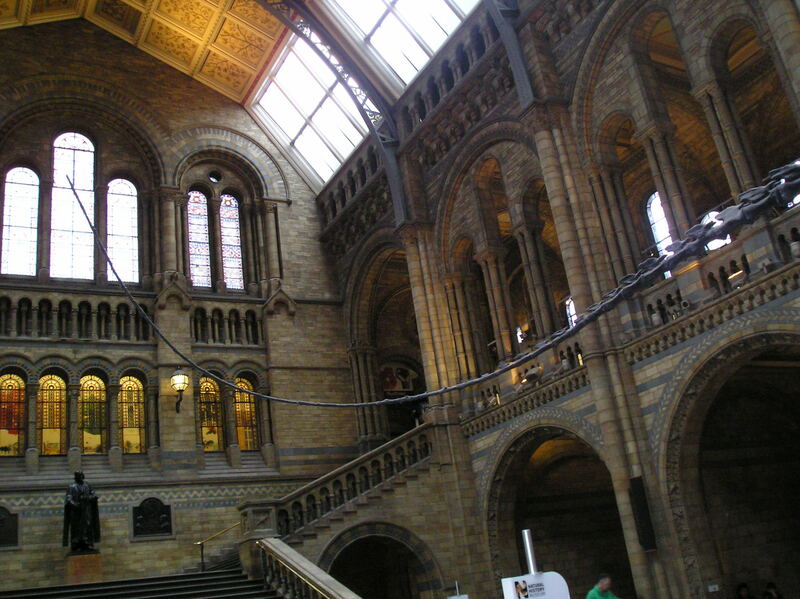 have specimens with complete dorsal columns. Janensch, Werner. 1914. Ubersicht uber der Wirbeltierfauna der Tendaguru-Schichten nebst einer kurzen Charakterisierung der neu aufgefuhrten Arten von Sauropoden. Archiv fur Biontologie, Berlin, III, 1(1):81-110. Migeod, Frederick W. H. 1931. British Museum East Africa Expedition: Account of the work done in 1930. Natural History Magazine 3(19): 87-103. Paul, Gregory S. 1988. The brachiosaur giants of the Morrison and Tendaguru with a description of a new subgenus, Giraffatitan, and a comparison of the world’s largest dinosaurs. Hunteria 2(3):1-14. Riggs, Elmer S. 1904. Structure and relationships of opisthocoelian dinosaurs: Part II, the Brachiosauridae. Field Columbian Museum, Geological Series 2, 6:229-247, plus plates LXXI-LXXV. Ventral, to be precise. Here are the first few cervicals of Cetiosaurus oxoniensis, from the mounted skeleton in the Leicester City Museum. 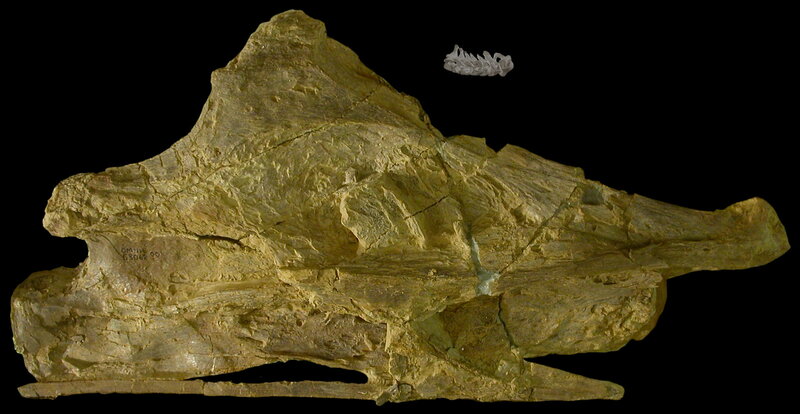 A more typical lateral view is shown below. Forget about the skull, it’s plastersaurus. We tend to think of vertebrae as cylinders with weird bits hanging off, and in most mammals that’s true. 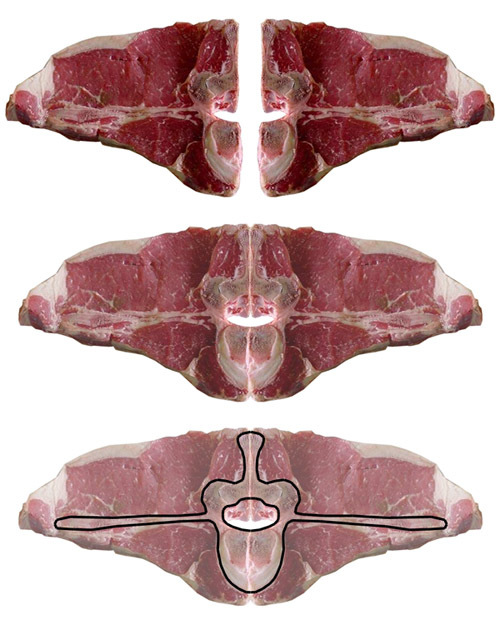 (Incidentally, the next time you eat a t-bone steak, have a look at the bone. It’s one half of a lumbar [non-rib-bearing trunk] vertebra. Proof at the bottom of the post.) But sauropod vertebrae are wacky, and nowhere more so than in the neck. The condyle and cotyle are round and point to the ancestral cylindrical state, but the centrum in between is often nothing like a cylinder. First, it is frequently waisted–narrower in the middle than at the ends, like an hourglass–as you can see in the ventral view at top. Second, the ‘walls’ of the cylinder are usually so eaten away by pneumatic openings that what is left looks like more like an I-beam or stick person in cross-section. So sauropod cervicals are often only round where they have to be–where they fit together. Hey, look, something red for Valentine’s Day! Awwww! Compared to what you’re used to, this photo is undeniably crappy. But it’s the only one I have to hand of something really quite interesting: the distal ‘whiplash’ part of the diplodocid tail. 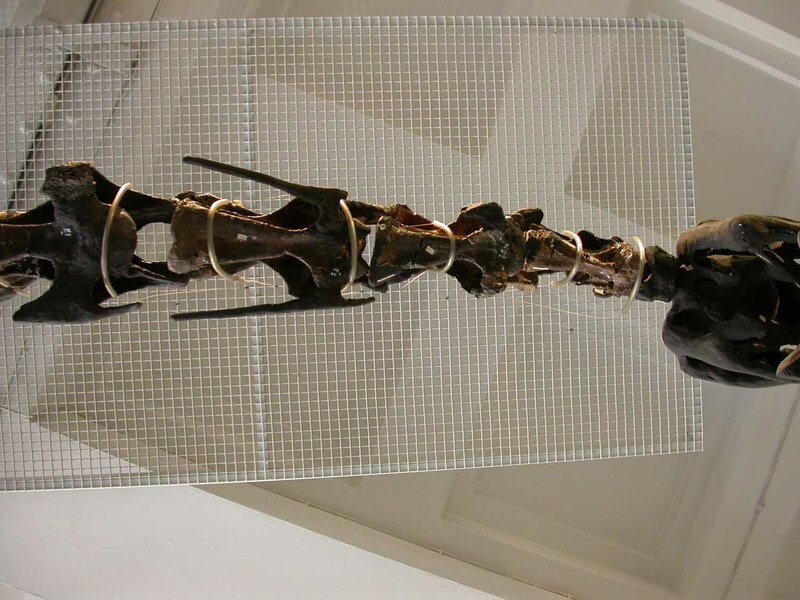 This whiplash belongs, of course, to the (remounted) Diplodocus carnegii cast displayed at the Natural History Museum in London (photo © NHM): as is well known among dinosaur aficionados, this is one of the eight copies made of the Carnegie Museum of Natural History composite specimen CM84* and distributed by Andrew Carnegie and W. J. Holland around the world. Casts of the Pittsburgh composite were also sent to Paris, Berlin, Vienna, St. Petersburg, Mexico City, and La Plata. One was also sent to Munich, but never got mounted. * The specimen is sometimes called just CM84, but in fact also bears the specimen numbers CM94 and CM307 for various of its parts. Several workers have popularized the idea that the distal ‘whiplash’ part of the diplodocid tail functioned in defence, the diplodocids flicking their immense tails to throw the thin, whip-like distal part towards an attacking theropod. Ever one to appeal to popular culture to help get his message across, Robert Bakker (1994) argued that the loss of muscles, nerves and joint prongs (=zygapophyses) on diplodocid whiplash caudals made them into an ideal ‘multijointed numchuck: a dinosaurian version of the weapon favoured by Michaelangelo of the Teenage Mutant Ninja Turtles’ (p. 33). 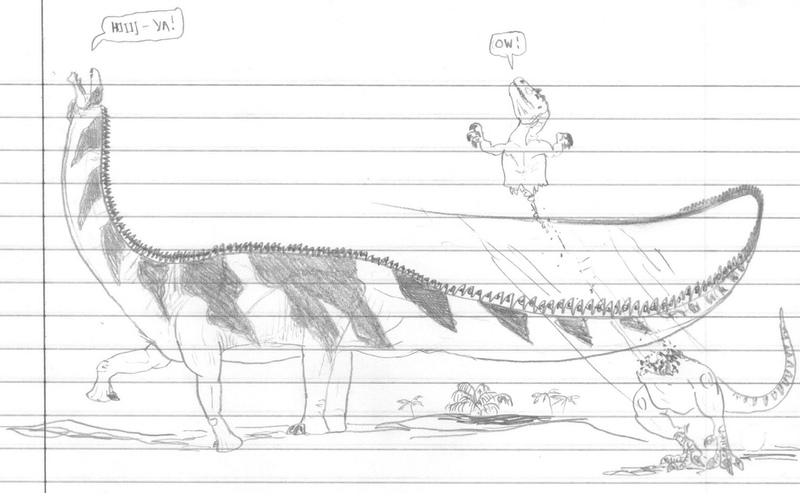 Because the tail-tip consisted of simple rods connected on all sides by tendons, said Bakker, the whiplash would be unbreakable, and a diplodocid ‘could whack away at an allosaur to its heart’s content without worrying about tail-bone breakage’ (p. 33) [hilarious image below, from here. Can be enlarged by the wonder of mouse-clicking]. 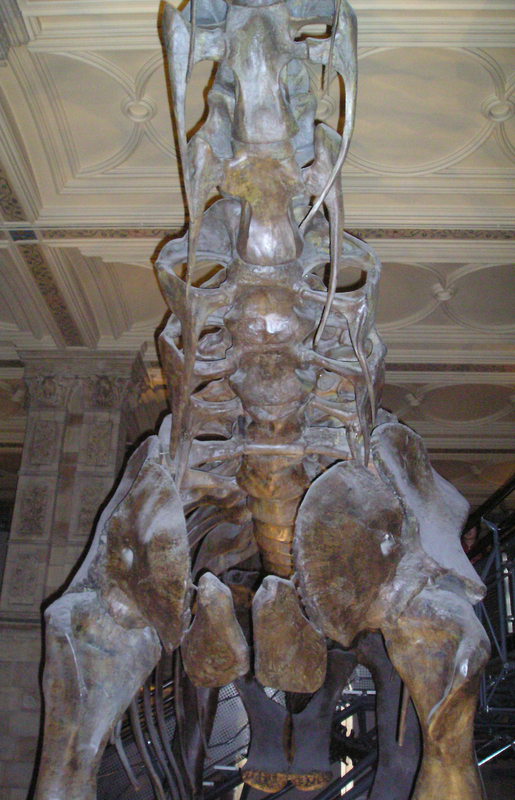 Alas, Per Christiansen (1996) challenged this idea, arguing that the general similarity present between the distal caudal vertebrae of diplodocids and those of other sauropods indicated the lack of any ‘special function’, that the fusion sometimes seen in diplodocid distal caudals was at odds with the idea of a whip-like function for the tail tip, and that diplodocids did not have tail musculature powerful enough to swing the tail in whip-like fashion. In strong contrast to what Bakker said, Per also argued that the small, thin distal caudals were unlikely to be strong enough to fend off an aggressive theropod, and he even suggested that the distal part of the tail might ‘simply come apart if striking another object with this amount of force’ (p. 56). Myhrvold & Currie (1997) also noted that the whiplash ‘was not well adapted as a direct-impact weapon’ (p. 393), and they gave similar reasons to those provided by Christiansen. But they also suggested that the tail-tip could perhaps be moved fast enough to generate a loud noise, and computer modelling suggested that the tail-tip could be moved at 540 m/s, fast enough to generate a supersonic crack (the speed of sound is 344 m/s). This noise might, they speculated, be a deterrent to big predators, especially those with sensitive hearing (Myhrvold & Currie further speculated that diplodocids might have communicated over distance using loud tail cracks). As always, there’s a lot more you could say about this subject, but it’s 2-30 am and I would like to get some sleep. Until next time! Bakker, R. T. 1994. The bite of the bronto. Earth 3 (6), 26-35. Christiansen, P. 1996. The “whiplash” tail of diplodocid sauropods: Was it really a weapon? In Morales, M. (ed.) The Continental Jurassic. Museum of Northern Arizona Bulletin 60, pp. 51-58. Myhrvold, N. P. & Currie, P. J. 1997. Supersonic sauropods? Tail dynamics in the diplodocids. Paleobiology 23, 393-409. These are stressful times as SV-POW! towers, with all three of in various ways involved in the aetosaur ethics business that is — finally — getting the coverage that it deserves. So I don’t want to talk about that here, not only because it’s nothing to do with sauropod vertebrae but also because it’s getting a lot of coverage elsewhere. As you all know, Sauroposeidon is the dinosaur with both the second-coolest name and — more relevant — the third longest neck (estimated at 11.5 m), being surpassed in that respect by Supersaurus (at least 13.3 m) and Mamenchisaurus sinocanadorum (maybe 12 m). 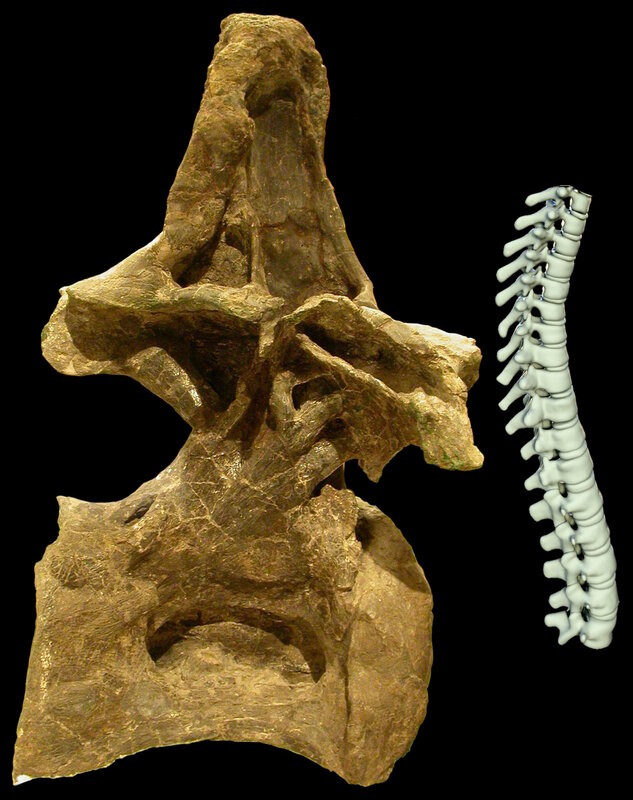 What we have here is C8 — the eighth and longest of the four preserved cervical vertebrae that constitute the holoype of Sauroposeidon, in right lateral view. Because it’s from the middle part of the neck, where vertebrae are most elongate, it is — just — the longest known vertebra in the world, coming it at a mighty 140 cm from the tip of the prezygapophysis to the cotyle. That gives it all of 2 cm over the 138 cm cervical of Supersaurus — although the latter’s prezygapophyses might be broken off, which would mean that this vertebrae would have been longer when complete. But what is that unsightly blob floating above the cervical, I hear you ask? That’s your neck. It’s an articulated sequence of the seven cervical vertebrae that make up a human neck, at about the right size for a largish adult male — a six-footer. I think you will agree that your neck is pathetic. For one reason and another, there are no decent published photographs of the Sauroposeidon material — just the tiny and frankly inadequate photo of the four-vertebra sequence squashed into about four square inches on page 353 of Wedel et al. 2000b. So you’re seeing this material for, really, the first time. Unless you count this.